"Razzle, dazzle and spread the news! Play in pink, all day in pink"
I am in "pink-love" with all of these kitchens!!! 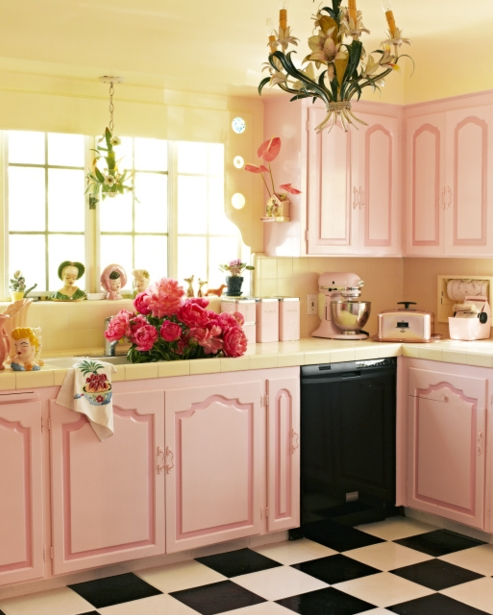 The above kitchen is a couple things I love: vintage, girly, pink and I love that buttery yellow too!! I imagine me pulling up to my house in my 50's Cadillac with big fins and carrying my groceries inside! 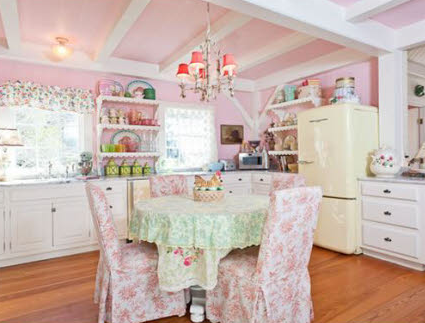 I I just learned that the "checkerboard" kitchen above, is the home of Miss Dita Von Teese! 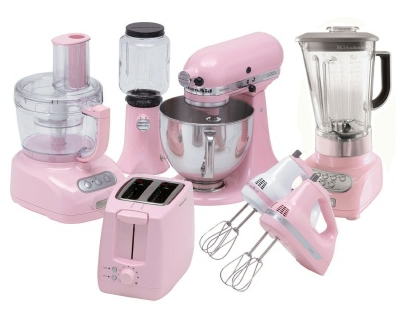 If you are worried your hubby may frown upon a pink kitchen... my grama always told me, your husband should not tell you how to decorate the house- that is a woman's sanctuary, you don't tell him how to set up the garage! ha ha ha And if it makes you happier, he should enjoy his "extra-happy" wife, even if your kitchen is painted in rainbows! I am in love with this kitchen for like a bajillion reasons. 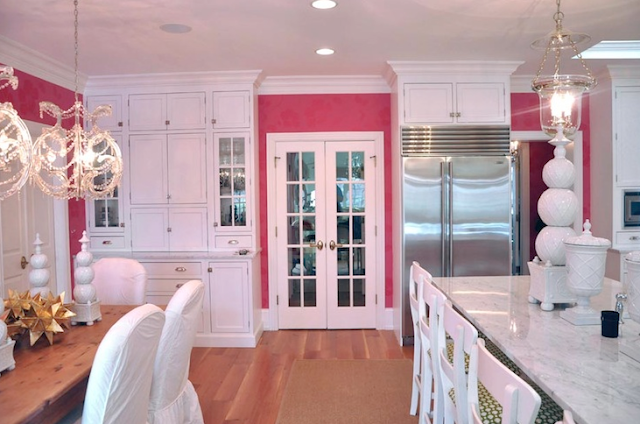 The chandeliers, The white cabinets- I LOVE white cabinets. The gold stars, the white chairs, the hint-of-hot-pink wall!!!! Not too much pink- just enough to make you smile! I don't care how impractical white cloth furniture seems- it's just gorgeous! Not too sure about "pink floral" wallpaper, but I still kinda like it! I love the little sitting area by the window, right off the kitchen. And the Strawberry Shortcake-like print on the barstools is just adorable! 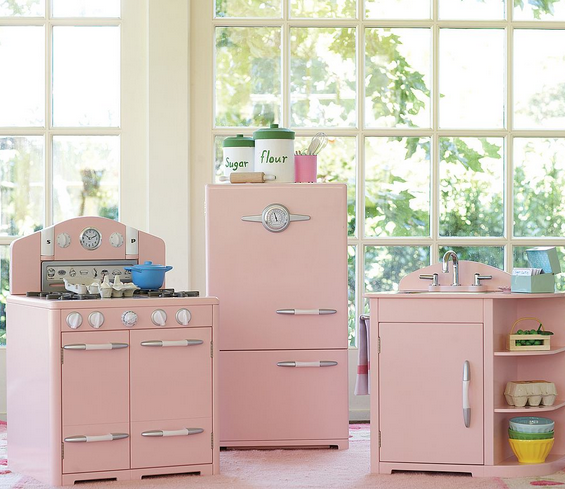 My Alani would love this kitchen, too! 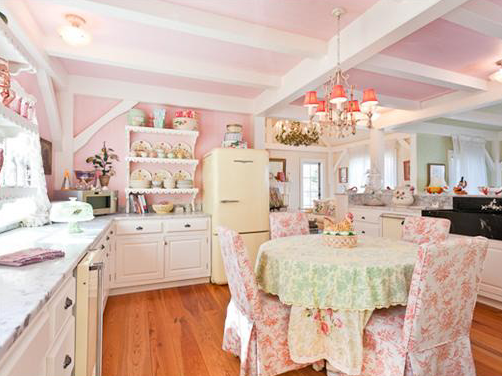 And it turns out I really want to wear a ruffley apron and bake a cake in Kirstie Alley's "cottage house" in Maine! 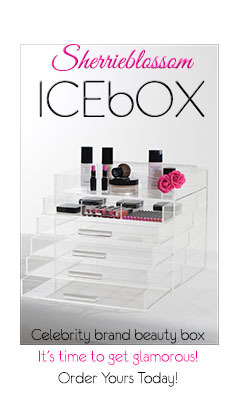 I love this- it just makes me want to whip up some cream cheese icing and slather it on everything! See it on realtor.com, for reals. And you can't leave out your mini-chefs! This retro pink kitchen is too cute for words! And can I just tell you how I love windows like that! This cuteness of course, hails from Pottery Barn Kids! Click here to see my little "pink cupcake and her pink make-up" for a smile! I'm in love. I wish I could have everything toilet. Love Kirstie's cottage!! Lmao.... Toile I meant. Stupid auto correct.